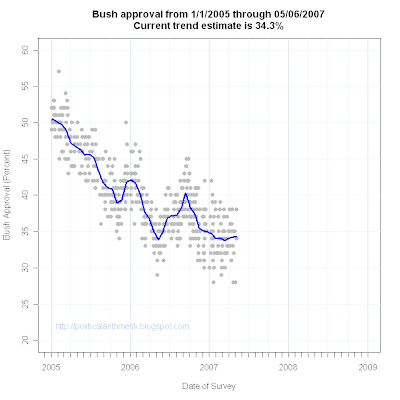 Three new polls put President Bush's approval at 34% or above, and bring my trend estimate to 34.3%. 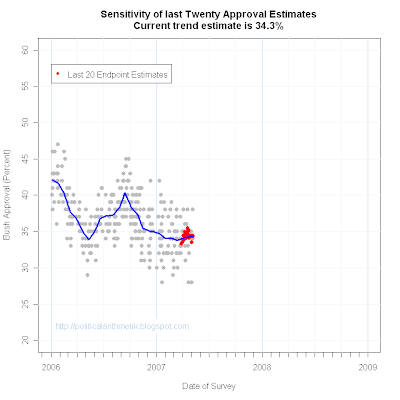 The Hotline poll, taken 4/26-30/07 but only released yesterday, has approval at 35%, disapproval at 62%. USAToday/Gallup, 5/4-6/07 has approval at 34%, disapproval at 63%. CNN/Opinion Research Corp., 5/4-6/07 has approval at 38% and disapproval at 61%. These results contrast with the weekend release of a Newsweek poll at 28%. Newsweek's story on the poll stressed the new low rating for President Bush. A Harris poll some 10 days earlier had also pegged approval at 28%. 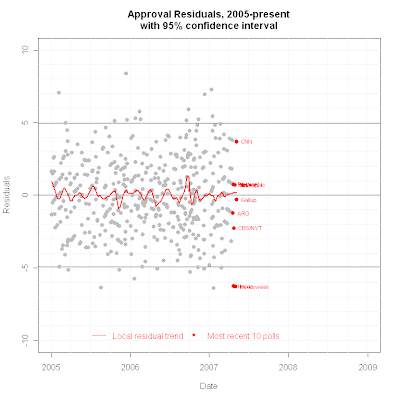 However, other recent polls at 32-35% failed to offer evidence for a sharp decline in Bush's approval. With the addition of these new polls at 35%, 34% and 38%, the trend estimate has returned to "flat", continuing a long period of stable approval in the 33-35% range which has persisted since December. The recent polls are plotted below. The CNN poll at 38% is a good bit above the trend estimate, while Gallup and Hotline are quite close. The CNN result is also a bit high compared to previous CNN polling which generally tracks the trend quite closely. 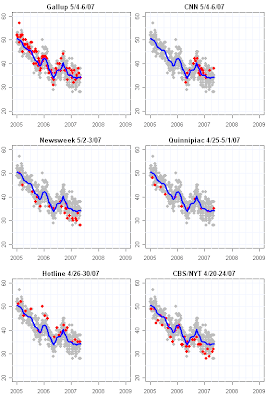 The addition of these new polls brings the trend estimate up, making the previous Harris and Newsweek surveys look like larger outliers than before. The upward shift also keeps the rather high CNN estimate within the 95% confidence interval, meaning that while it is high it is not a statistical outlier. The current trend remains within the uncertainty range of the trend estimate. The current uncertainty, with polls ranging from 28-38 percent, is rather large but not suspiciously so. Finally, the various estimates of trend for the last 20 polls shows a strong clustering in the 34-35 percent range, so the evidence remains good for approval in this narrow range.